2015 Multi-award winner (Top 2) for excellence and sales from BOTH Down Under Answers & Africa Answers. 2014 Multi-award winner (Top 5) for excellence and sales from BOTH Down Under Answers & Africa Answers. These awards were presented by the wholesaler in the form of Artworks representing both The South pacific & Africa divisions. In 2014 Matt was #4 for South Pacific and #2 for Africa. In 2015 matt stepped it up a notch and received two more pieces of artwork for #2 in South Pacific and #1 for Africa. Matt was the ONLY agent working with these wholesalers to receive awards in both divisions... and then did that again in 2015. 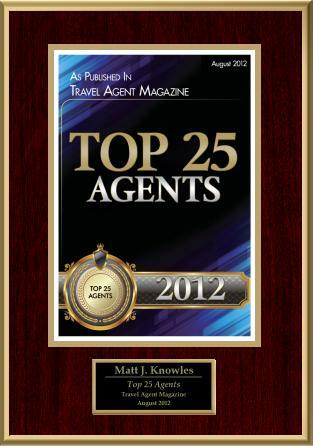 No other travel agent in North America has that honor! Sea Escape Travel has earned many awards for their outstanding commitment to excellence! Matt of Sea Escape TRAVEL is a Aussie PREMIER Specialist. The ONLY Aussie PREMIER in the Sacramento area, as designated by Tourism Australia. 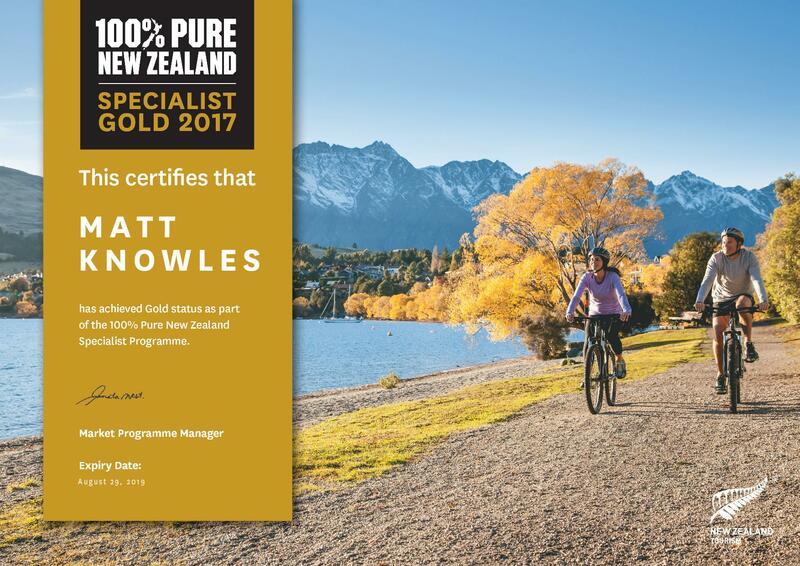 There are only 80 PREMIERS in all of North America, so this designation for Matt is special for you - extra training, extra knowledge, and extra relationships with suppliers and wholesalers for the best VALUES in planning your next trip to Australia. Matt knows Australia, and continues to learn with every trip made Down under. He currently has over 12 trips to Australia, and has visited EVERY State & Territory. Through these "learning trips" he visits hotels & resorts, does lots of touring, and samples the great foods that are giving Australia multiple awards worlwide. 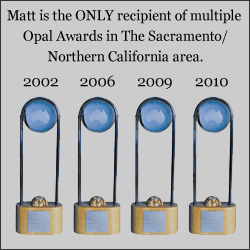 Matt is also the receipient of FIVE prestigious awards for excellence from Tourism Australia - The OPAL Award (pictured left). AWARD #5 received in MARCH 2017. This award is limited to five each year, in different categories. Matt continues to grow his excellence every year by being selected to Advisory Boards for: Tourism Australia's Steering Committee, State of Queensland Board, and as a judge for Traveling in Australia Magazine. Matt is also known as The Aussie TRAVEL Pro. As qualified Kiwi Specialists our staff have undergone extensive training and are certified by Tourism New Zealand as Kiwi Specialists. 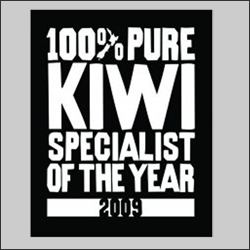 Matt has been a certified KIWI Specialist for New Zealand since 2004. Specializing in New Zealand our Kiwi Specialists can help you with every aspect of your holiday from arranging flights to creating your very own personalized self-drive itinerary. Whether it’s your first time or fifth time to New Zealand our specialists can give you up to date and informed advice to make your holiday experience truly unique. 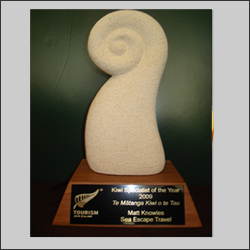 <------ Matt received the award for Kiwi Specialist of The Year in 2009 for ALL North America!! 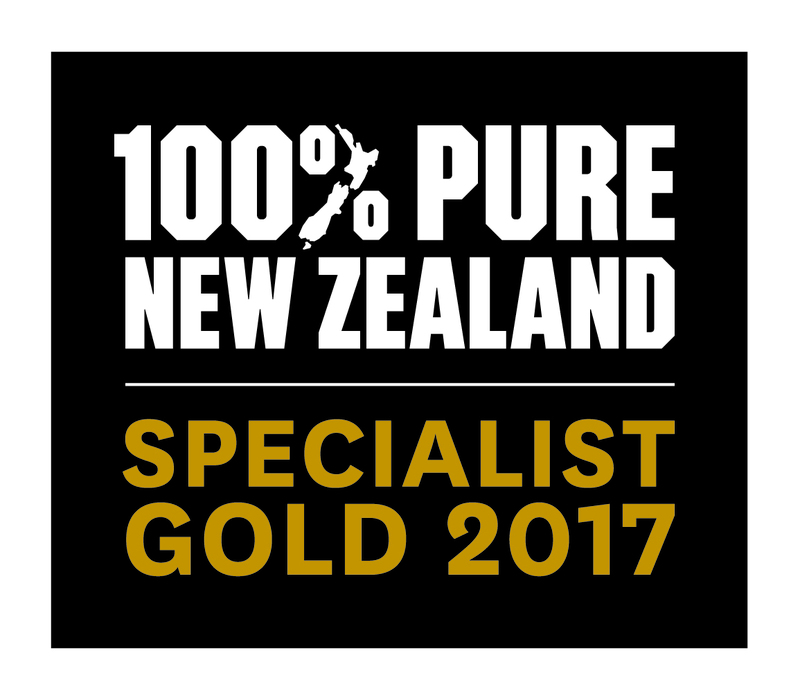 As qualified Kiwi Specialists our staff have undergone extensive training and are certified by Tourism New Zealand as Kiwi Specialists.